At one time, Back to My Mac worked well for me. But in the last year or so, I find it rarely works when I’m on the road. Any reason why? I’ve had the same experience. And, at least in my case, one reason it didn't work is because I hadn't set up my base station correctly. 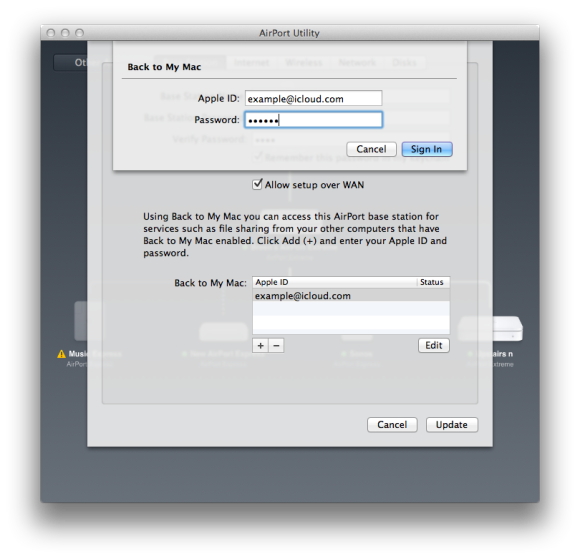 Specifically, you first want to be sure that you have an iCloud account as that’s now the avenue for using Back to My Mac. If you have an 802.11n AirPort Express or AirPort Extreme base station with the latest firmware (7.6.1 or 7.6.2) under Lion or Mountain Lion, fire up the latest version of AirPort Utility (found in /Applications/Utilities). Select your base station in the resulting window and click the Edit button in the bottom-right corner. In the sheet that appears you’ll see a Back to My Mac option. If the Apple ID tied to your iCloud account doesn’t appear in this area, that’s likely your problem. To resolve it, click the Plus (+) button and in the Back to My Mac sheet that appears, enter your Apple ID and password and click Sign In. Your Apple ID should now appear where it’s supposed to. Click the Update button to update your base station. If that doesn’t fix the problem, here’s the next step. Launch System Preferences on the Mac you intend to use to access your remote Mac, select the iCloud preference, and uncheck the Back to My Mac option. Quit System preferences. Now launch Keychain Access (found in /Applications/Utilities). Select the System keychain and check that the All Items entry under the Category heading is selected. In the Search field enter back to my Mac. In the list below you should see at least one entry whose kind is Back to My Mac key. Select any of these keys that you find and delete them. 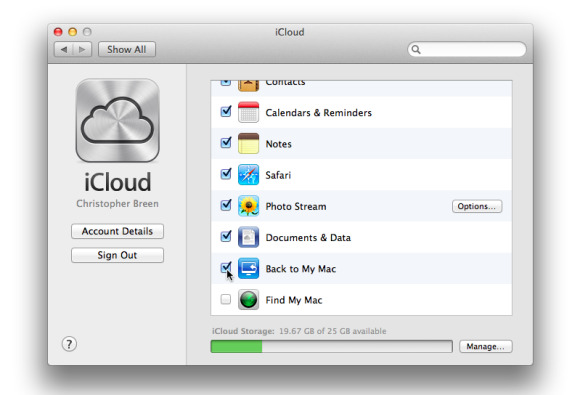 Return to the iCloud system preference and switch Back to My Mac on. What was this all about? It’s possible that you had some old Back to My Mac keys left over from the MobileMe days, and those old keys were gumming up the works. If you took the trouble to follow the first of these instructions and found that there were no such keys, then the dregs of MobileMe isn’t your problem. So, what else might it be? Back to My Mac needs cooperation on both ends. While your Mac and its base station may be set up perfectly well, the router you’re running through while on the road may not allow you to use the service. Thankfully you have alternatives. The one I rely on in such situations is LogMeIn. Create a free account with LogMeIn, launch and configure the LogMeIn application on the Mac you wish to access, leave that Mac running, and access it from any computer’s web browser. From that web browser you can share that Mac’s screen and manipulate its files. For example, if you’ve left an important file at the office, you can email it to yourself or add it to a Dropbox folder. And if you’re using an iOS device, you can use the free LogMeIn app to do the same thing from an iPhone, iPod touch, or iPad.